While on our cross-country move, we got to visit some great friends, the G Family. Their kids were excited about being "guest bloggers" and enlisted their engineering dad to design these cool treats. We had a really fun visit and they put together these amazing treats for me! 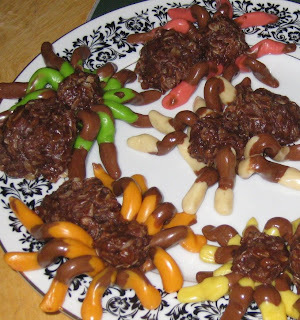 These would be fun for a "Birthday Bug Party" or even for Halloween! Thanks, G Kids! The hard part is done, now for the bodies! Mix together sugar, butter or margarine, and milk in a saucepan. Bring to a boil and boil for one minute, stirring constantly. Remove from heat and mix in cocoa, quick oatmeal and vanilla. Drop by tablespoon and teaspoon onto wax paper to cool (you want one tablespoon-sized cookie and one teaspoon-sized cookie for each spider). If they spread apart too much, push them back together as they cool. 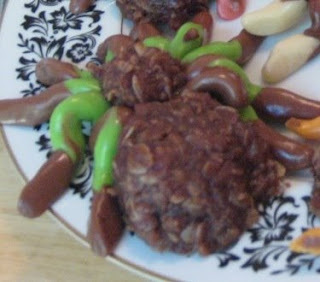 When cookies are set, place on top of your spider bodies--the larger cookie goes between the legs andthe smaller cookie should sit on top of the legs. Watch them crawl off the plate! Thanks to Miss N, Miss A and Miss C for this great tutorial! You are all well on your way to becoming great chefs! Keep up the kitchen fun and thanks for the great visit! Back to School Treats Roundup!